Luke Skywalker was an unlikely hero. His story began as a simple orphan farmer who, unbeknownst to him, was destined to save a galaxy on the brink of destruction. But young Luke didn’t care about Death Stars, lightsabers, the Force or Han Solo’s gambling debts – he just wanted to go to the Tashi station and pick up some power converters. Much like Luke Skywalker, the 2009 Jaguar XF carries with it the heavy burden of being the one destined to determine the outcome of Jaguar’s shaky future. Recently offloaded to India’s Tata Motors by parent company Ford after not returning a profit over seventeen years of ownership, Jaguar very much needs a savior if it is to survive in the 21st century. Debuting at the 2007 Detroit Auto Show, the XF looked like a radical departure for Jaguar; but in the metal, the production model is no longer shocking, rather striking and refreshingly elegant. Coupe-like in its design and dynamics, the XF just might be the chosen one beleaguered Jaguar has been so desperately searching for. Next-generation looks set the XF apart from its competitors; it is not a car for the shy, as it will draw glances of intrigue everywhere. The supercharged engine launches the XF down the road with remarkable ease and smoothness. The rising gear selector and rotating air vents are super cool but could prove an expensive fix if their motors ever fail. A lot of the XF’s functions, including much of the climate control system, are activated through the multimedia screen, which can make finding the exact option you’re looking for complicated. The moment you depress the Start/Stop button the XF, strange things start to happen. As the engine catches with a subdued supercharged growl, a cylindrical gear selector rises from its flush position in the center console, and the air vents perform a “look at meâ€ act of their own, flipping around from their flat position in the dash. It sounds dramatic, but in reality fits the high-tech approach of the XF well. Once out on the road, the XF is keen to make quiet, rapid progress. The engine contains a whole lot of grunt – 420 horsepower’s worth – but the XF is so well insulated that you’ll have to turn down the Bach (this is a Jag, after all) to hear it. Power is eye opening at any rpm due to a supercharger-assisted torque curve that graphs closer to a straight line than an arc. As a result of all this power, the XF can run from 0-60 mph in 5.1 seconds and, thanks to the massive grip afforded by 20-inch wheels, the XF rarely breaks loose, even with the traction control turned off in sport mode. The steering is properly weighted for a car of this mass, allowing the driver to easily point the car through the turns. Paddle shifting adds to the evocative drive, though their plastic construction is at odds with the rest of the XF’s interior components. Power comes from a 4.2-liter V-8, which produces 420 horsepower and 413 lb-ft of torque. Torque is driven through the rear wheels via Jag’s six-speed automatic – arguably the best traditional auto in the industry – and downshifts are seamlessly rev-matched with the speed of the engaging gear. Being as the XF is a large, comfortable sedan perfect for long freeway trips, opting for active cruise control is very much advised. The system works by using radar to detect the distance between you and the traffic in front, and adjusts the XF’s speed accordingly, braking in traffic or downshifting and accelerating to your preset speed once it’s safe to do so. Aside from the aforementioned 20-inch alloys, which properly fill the XF’s wheel wells, the supercharged model includes enlarged brakes and Jaguar’s thematically titled “CATSâ€ active suspension system, which works to quell body roll in the corners. A blind spot warning system comes standard on supercharged XFs, warning drivers of vehicles sitting in their flanks by illuminating a small icon in the rearview mirror when another car is detected in the blind spot. The supercharged XF also comes with technological upgrades such as front park assist, navigation, a rearview camera and upgraded sound system; but rockers be warned, the system’s maximum volume is relatively low, feeling more Dido than AC/DC. Supercharged 4.2-liter V-8; words that strike fear into the hearts of fuel-conscious consumers everywhere. While it can be argued that a fuel budget wouldn’t be of much concern to most would-be XF owners, news on the Jag’s fuel consumption isn’t as bad as one might guess, as it manages to return 15 mpg around the city and 23 mpg on the highway, and achieves an LEV-II emissions rating. While the XF might be a new design, the interior is traditional, lavish Jaguar. Space is ample despite the somewhat truncated roofline and the seats won’t create any aches or cramps on even the longest of highway stints. Wood trim adorns the dash and aluminum accents give the XF an appropriately 21st century finish. From a dead-on side profile view, the XF appears to be little more than a typical modern, streamlined luxury sedan on large wheels. From the front, however, the isolated metal grille and squinty headlights along with the subtly bulging hood give the XF a truly unique look, as does the clean-cut rear end. While base model XF pricing begins in the $49,000 range, with an MSRP of $62,975, entry into the XF Supercharged fraternity doesn’t come cheap. Luckily, only one option – active cruise control – is available as the supercharged model includes a lot of upgrades in the base price. As such, it’s unlikely buyers will be looking at prices above the $66,000 barrier, meaning the XF undercuts the similarly dynamic Mercedes-Benz CLS550 and Audi S6, though it is priced a few thousand dollars above the V-8 equipped BMW 550i and Mercedes-Benz E550. 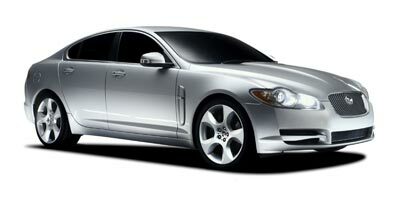 That’s not to mention the XF’s stable mate, the supercharged XJ-R that comes in at a whopping $83,585. Even though Jaguar hasn’t truly put all its eggs in one basket – a new XJ is due in 2010 – only time will tell if the XF gamble goes down as the marque’s ultimate savior or its last brave folly. Given the current economic situation, it’s hard to say how the whole scenario will play out, though it’d be a shame to see a sedan this good suffer lackluster sales due to an uncertain financial outlook. Oh yeah, there’s also an even more powerful XF-R version on the way. Indeed, the force is strong with this one.